A toll road, also known as a turnpike or tollway, is a public or private road (almost always a controlled-access highway in the present day) for which a fee (or toll) is assessed for passage. It is a form of road pricing typically implemented to help recoup the cost of road construction and maintenance. Toll roads have existed in some form since antiquity, with tolls levied on passing travellers on foot, wagon, or horseback; but their prominence increased with the rise of the automobile, and many modern tollways charge fees for motor vehicles exclusively. The amount of the toll usually varies by vehicle type, weight, or number of axles, with freight trucks often charged higher rates than cars. Tolls are often collected at toll booths, toll houses, plazas, stations, bars, or gates. Some toll collection points are unmanned and the user deposits money in a machine which opens the gate once the correct toll has been paid. To cut costs and minimise time delay many tolls are collected by some form of automatic or electronic toll collection equipment which communicates electronically with a toll payer's transponder. Some electronic toll roads also maintain a system of toll booths so people without transponders can still pay the toll, but many newer roads now use automatic number plate recognition to charge drivers who use the road without a transponder, and some older toll roads are being upgraded with such systems. Criticisms of toll roads include the time taken to stop and pay the toll, and the cost of the toll booth operators—up to about one-third of revenue in some cases. Automated toll-paying systems help minimise both of these. Others object to paying "twice" for the same road: in fuel taxes and with tolls. Entrance fees collection in a local community road checkpoint near Bagan (Myanmar). Toll roads have existed for at least the last 2,700 years, as tolls had to be paid by travellers using the Susa–Babylon highway under the regime of Ashurbanipal, who reigned in the 7th century BC.Aristotle and Pliny refer to tolls in Arabia and other parts of Asia. In India, before the 4th century BC, the Arthashastra notes the use of tolls. Germanic tribes charged tolls to travellers across mountain passes. A 14th-century example (though not for a road) is Castle Loevestein in the Netherlands, which was built at a strategic point where two rivers meet. River tolls were charged on boats sailing along the river. The Øresund in Scandinavia was once subject to a toll to the Danish Monarch, who derived a sizable portion of his revenue from it. In the 20th century, road tolls were introduced in Europe to finance the construction of motorway networks and specific transport infrastructure such as bridges and tunnels. Italy was the first European country to charge motorway tolls, on a 50 kilometres (31 mi) motorway section near Milan in 1924. It was followed by Greece, which made users pay for the network of motorways around and between its cities in 1927. Later in the 1950s and 1960s, France, Spain, and Portugal started to build motorways largely with the aid of concessions, allowing rapid development of this infrastructure without massive state debts. Since then, road tolls have been introduced in the majority of the EU member states. In the United States, prior to the introduction of the Interstate Highway System and the large federal grants supplied to states to build it, many states constructed their first controlled-access highways by floating bonds backed by toll revenues. Starting with the Pennsylvania Turnpike in 1940, and followed by similar roads in New Jersey (New Jersey Turnpike, 1952 and Garden State Parkway, 1954), New York (New York State Thruway, 1954), Massachusetts (Massachusetts Turnpike, 1957), and others, numerous states throughout the 1950s established major toll roads. With the establishment of the Interstate Highway System in the late 1950s, toll road construction in the U.S. slowed down considerably, as the federal government now provided the bulk of funding to construct new freeways, and regulations required that such Interstate highways be free from tolls. Many older toll roads were added to the Interstate System under a grandfather clause that allowed tolls to continue to be collected on toll roads that predated the system. Some of these such as the Connecticut Turnpike and the Richmond–Petersburg Turnpike later removed their tolls when the initial bonds were paid off. Many states, however, have maintained the tolling of these roads as a consistent source of revenue. London, in an effort to reduce traffic within the city, instituted the London congestion charge in 2003, effectively making all roads within the centre of the city tolled. Turnpike trusts were established in England and Wales from about 1706 in response to the need for better roads than the few and poorly-maintained tracks then available. Turnpike trusts were set up by individual Acts of Parliament, with powers to collect road tolls to repay loans for building, improving, and maintaining the principal roads in Britain. 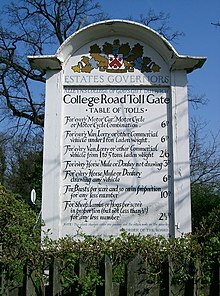 At their peak, in the 1830s, over 1,000 trusts administered around 30,000 miles (48,000 km) of turnpike road in England and Wales, taking tolls at almost 8,000 toll-gates. The trusts were ultimately responsible for the maintenance and improvement of most of the main roads in England and Wales, which were used to distribute agricultural and industrial goods economically. The tolls were a source of revenue for road building and maintenance, paid for by road users and not from general taxation. The turnpike trusts were gradually abolished from the 1870s. Most trusts improved existing roads, but some new roads, usually only short stretches, were also built. Thomas Telford's Holyhead road followed Watling Street from London but was exceptional in creating a largely new route beyond Shrewsbury, and especially beyond Llangollen. Built in the early 19th century, with many toll booths along its length, most of it is now the A5. In the modern day, one major toll road is the M6 Toll, relieving traffic congestion on the M6 in Birmingham. A few notable bridges and tunnels continue as toll roads including the Dartford Crossing and Mersey Gateway bridge. Motorway and other Infrastructure Tolling: The term tolling is used for charging a well-defined special and comparatively costly infrastructure, like a bridge, a tunnel, a mountain pass, a motorway concession, or the whole motorway network of a country. Classically a toll is due when a vehicle passes a tolling station, be it a manual barrier-controlled toll plaza or a free-flow multi-lane station. Some toll roads charge a toll in only one direction. Examples include the Sydney Harbour Bridge, Sydney Harbour Tunnel, and Eastern Distributor (these all charge tolls city-bound) in Australia, in the United States, crossings between Pennsylvania and New Jersey operated by Delaware River Port Authority and crossings between New Jersey and New York operated by Port Authority of New York and New Jersey. This technique is practical where the detour to avoid the toll is large or the toll differences are small. 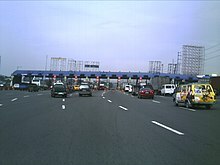 Balintawak toll plaza of the North Luzon Expressway in Caloocan, Philippines. The toll barrier has both electronic toll collection and cash payment in the same barrier, before a new toll plaza was added. In 2018 Rhode Island became one of the first states to setup gantries to exclusively toll only tractor trailer trucks. Gantry shown on I-95 North. Traditionally tolls were paid by hand at a toll gate. Although payments may still be made in cash, it is more common now to pay using an electronic toll collection system. In some places, payment is made using transponders which are affixed to the windscreen. Three systems of toll roads exist: open (with mainline barrier toll plazas); closed (with entry/exit tolls); and open road (no toll booths, only electronic toll collection gantries at entrances and exits or at strategic locations on the median of the road). Modern toll roads often use a combination of the three: for example, the Pennsylvania Turnpike and Florida's Turnpike implement all three systems in different sections. On an open toll system, all vehicles stop at various locations along the highway to pay a toll. (This is different from "open road tolling", where no vehicles stop to pay a toll.) While this may save money from the lack of need to construct toll booths at every exit, it can cause traffic congestion while traffic queues at the mainline toll plazas (toll barriers). It is also possible for motorists to enter an 'open toll road' after one toll barrier and exit before the next one, thus travelling on the toll road toll-free. Most open toll roads have ramp tolls or partial access junctions to prevent this practice, known in the U.S. as "shunpiking". With a closed toll system, vehicles collect a ticket when entering the highway. In some cases, the ticket displays the toll to be paid on exit. Upon exit, the driver must pay the amount listed for the given exit. Should the ticket be lost, a driver must typically pay the maximum amount possible for travel on that highway. Short toll roads with no intermediate entries or exits may have only one toll plaza at one end, with motorists travelling in either direction paying a flat fee either when they enter or when they exit the toll road. In a variant of the closed toll system, mainline barriers are present at the two endpoints of the toll road, and each interchange has a ramp toll that is paid upon exit or entry. In this case, a motorist pays a flat fee at the ramp toll and another flat fee at the end of the toll road; no ticket is necessary. In addition, with most systems, motorists may pay tolls only with cash and/or change; debit and credit cards are not accepted. However, some toll roads may have travel plazas with ATMs so motorists can stop and withdraw cash for the tolls. The toll is calculated by the distance travelled on the toll road or the specific exit chosen. In the United States, for instance, the Kansas Turnpike, Ohio Turnpike, New Jersey Turnpike, most of the Pennsylvania Turnpike, Indiana Toll Road, New York State Thruway, and Florida's Turnpike currently implement closed systems. The first major deployment of an RFID electronic toll collection system in the United States was on the Dallas North Tollway in 1989 by Amtech (see TollTag). The Amtech RFID technology used on the Dallas North Tollway was originally developed at Sandia Labs for use in tagging and tracking livestock. In the same year, the Telepass active transponder RFID system was introduced across Italy. Several US states now use mobile tolling platforms to facilitate use of payment via smartphones. The first all-electronic toll road in the eastern United States, the InterCounty Connector (Maryland Route 200) was partially opened to traffic in February 2011, and the final segment was completed in November 2014. The first section of another all-electronic toll road, the Triangle Expressway, opened at the beginning of 2012 in North Carolina. Some toll roads are managed under such systems as the Build-Operate-Transfer (BOT) system. Private companies build the roads and are given a limited franchise. Ownership is transferred to the government when the franchise expires. This type of arrangement is prevalent in Australia, Canada, Hong Kong, India, South Korea, Japan, and the Philippines. The BOT system is a fairly new concept that is gaining ground in the United States, with California, Delaware, Florida, Illinois, Indiana, Mississippi, Texas, and Virginia already building and operating toll roads under this scheme. Pennsylvania, Massachusetts, New Jersey, and Tennessee are also considering the BOT methodology for future highway projects. People who have to use a toll road when driving to work, might have to pay fairly much on an annual basis, while colleagues living elsewhere do not have to pay any toll. ^ "Road Pricing Defined". Federal Highway Administration. Archived from the original on 2012-07-02. Retrieved 2012-05-23. ^ Gilliet, Henri (1990). "Toll roads-the French experience." Transrouts International, Saint-Quentin-en-Yvelines. ^ Jordi, Philipp (2008): "Institutional Aspects of Directive 2004/52/EC on the Interoperability of Electronic Road Toll Systems in the Community." Europainstitut der Universität Basel. ^ Searle 1930, p. 798. ^ "Toronto.ca". Archived from the original on 30 September 2007. Retrieved 19 September 2014. ^ "Lostrivers.ca". Archived from the original on 19 May 2014. Retrieved 19 September 2014. ^ Patton, Phil (2008-10-12). "A 100-Year-Old Dream: A Road Just for Cars". The New York Times. Archived from the original on 2008-12-09. Retrieved 2010-03-27. ^ "BBS.keyhole.com". Archived from the original on 22 September 2009. Retrieved 19 September 2014. ^ Oehry, Bernhard (2004): Tolling with Satellites – a System Concept for Everybody?" in: Jordi, Philipp (2008): "Institutional Aspects of Directive 2004/52/EC on the Interoperability of Electronic Road Toll Systems in the Community." Europainstitut der Universität Basel. ^ "Union Watersphere". lostinjersey.wordpress.com. March 19, 2009. Archived from the original on August 29, 2013. Retrieved 2012-02-23. ^ "407ETR.com" (PDF). Archived from the original (PDF) on 2010-01-01. ^ Michael Dresser (2011-02-07). "First phase of ICC to open Feb. 22". Baltimore Sun. Archived from the original on 2011-02-10. Retrieved 2011-02-07. ^ Kevin Rector (2014-11-05). "Final section of ICC to Laurel, new I-95 interchange to open this weekend". Baltimore Sun. Archived from the original on 2015-06-26. Retrieved 2015-06-19. ^ "Drivers roll on state's first toll road". WRAL.com. 2012-01-31. Retrieved 2012-04-07. ^ Roth, Gabriel (1998). Roads in a market economy. Ashgate Publishing Company. p. 122. ISBN 978-0-291-39814-7. ^ von Hirschhausen, Christian (2002-01-01). Modernizing Infrastructure in Transformation Economies. p. 155. ISBN 9781781959787. Archived from the original on 2018-03-01. Wikimedia Commons has media related to Toll roads. International Bridge, Tunnel and Turnpike Association The International Bridge, Tunnel and Turnpike Association (IBTTA) is the worldwide alliance of toll operators and associated industries that provides a forum for sharing knowledge and ideas to promote and enhance toll-financed transportation services.